The Bears called a press conference to announce the firing of Ron Turner as Offensive coordinator and most of his staff (except WR Coach Darryl Drake & RB Coach Tim Spencer). 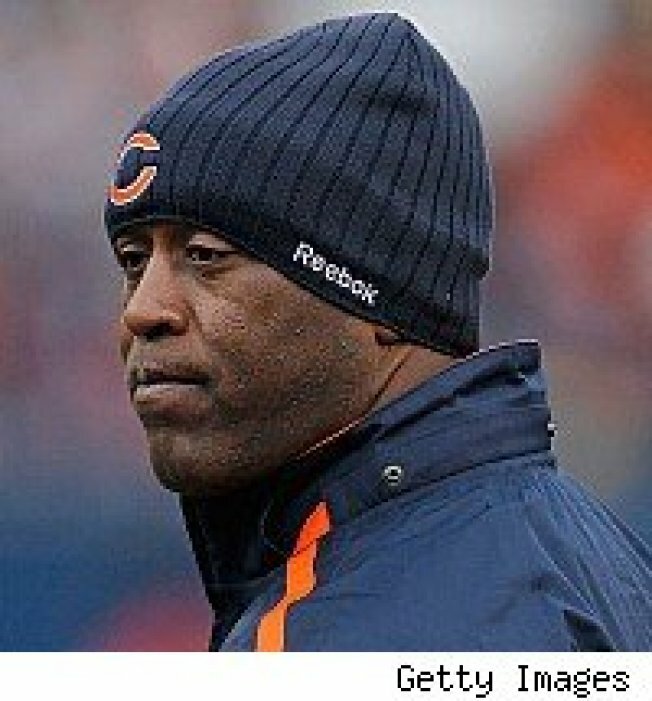 In the process they "announced" Lovie Smith would return next year. The fact they needed to announce a coach under contract was returning was the first hint of the hot seat Lovie sat on this season. Bears team president Ted Phillips said his low point was the Cincinnati loss, but then the season got progressively worse and he began evaluating both General Manager Jerry Angelo and Lovie Smith. Way before those final two wins. So when Lovie Smith took the podium instead of talking about Ron Turner and the failings of the offense, he faced a firing squad of questions about the failings of his defense. HIS defense since he was defensive coordinator. While he interviews potential offensive coordinators, Smith is keeping an open mind on schemes, as long as it is a balanced offense. But when it comes to defense. He's sticking with his Cover-2. Smith continues to believe the failings of a 17Th ranked defense was about execution. Still there is a problem. A Tampa 2 must stop the run first, and the Bears finished 23rd against the run. As one former Bears defender under Lovie Smith said, "their defense is obsolete". And his current team proved so by demolishing the Bears in their meeting this season. "Tampa 2 works if you have Pro Bowlers" he said. That's PRO BOWLERS with an "s". Not just one Pro Bowler as in Lance Briggs. He continued, "it's not scheme based" explaining, the Bears basic defensive philosophy relies on the stud athletic players they no longer have. Tommie Harris at the 3-technique. Brian Urlacher Pro Bowl Middle Linebacker (when? ), and shut down corner backs -- eh, the Bears have NEVER had that. "Tampa 2 is Tampa 2, just like a bunk bed is a bunk bed. You can change the sheets and blankets. It is what it is." Thus, every team can scheme the Bears because it isn't about the scheme changing, its about players making plays. And the Bears just don't have enough PLAYMAKERS on defense. When Smith was pressed on why he is so stubborn in sticking with his defensive scheme at the press conference, he got defensive. The Bears need Tommie Harris to return to form, they need Brian Urlacher to be a Pro Bowler again. They need some shutdown corners. Lovie Smith needs them next year to save his job, because he's not changing his philosophy.